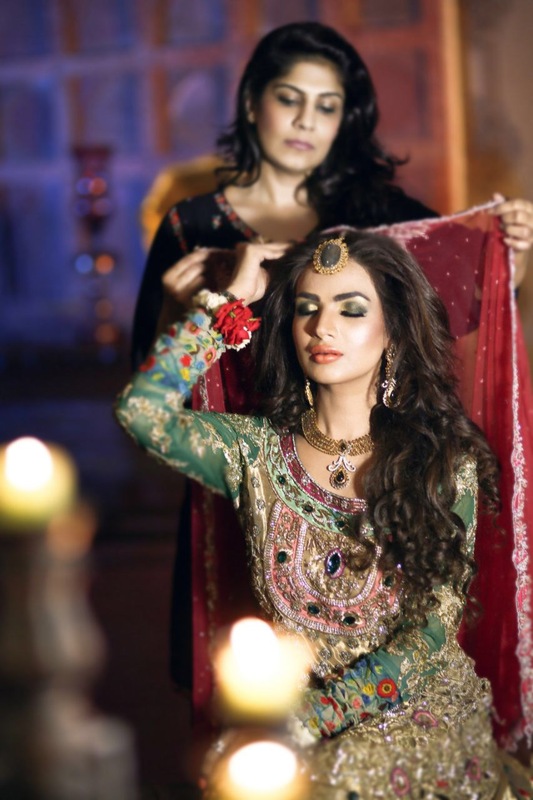 Shamaeel translates old France splendour into her bridal collection! When it comes to bridal wear, every woman dreams of an exquisite design which not only stuns the audience, but remains imprinted upon their minds for a long time. When we hear the name ‘Versailles’, it immediately brings the concepts of beauty, luxury and grandeur to mind. Versailles has been the inspiration for the latest bridal collection designed by Shamaeel Ansari, a name which itself is associated with opulence and creativity. The collection is a study in the imaginative and creative genius of the palace of Versailles – home to some of the world’s most superb art pieces. The designs will hold you in awe with a burst of splendidly combined colour and fabric combinations. Each dress seems to be intricately formulated with a lot of attention to detail, like a painting that has been completed with tender love and care. A touch of the vintage craftsmanship makes each design elegant to behold. The summer bride needs to look no further to find the perfect dress which will enthral everyone. The magnificence of Versailles has been translated into this collection delightfully, by the sheer genius of Shamaeel, who holds a 33-year long experience in designing. Her brand is known globally for providing excellence in design quality. The collection has set the bridal market ablaze on April 16 with its long awaited launch. It is so regal that you will not be able to help yourself from getting your hands onto one of the designs at least. The silhouettes, style of draping, the long coats, embroidery themes and jackets will give the wearer the opulence of 16th Century France combined with feminine grace which is the ultimate desirable goal of a bride and anyone else wanting to turn heads. The work is unmatched in its glory of embellishments of sequins and jewels in muted tones. The appliqué and embroideries will dazzle and entrance! We can guarantee that you will feel nothing short of walking like a royal courtier down the halls of the glorious palace of Versailles in one of Shameel’s creations. Watch the video to see some of the resplendent stunning designs of Shamaeel’s ‘Versailles’! Hair fall is something that causes much heartache to several women across the world. To combat this, Sunsilk provides you a pack of products that are the Hair Fall Solution Shampoo and Conditioner. This has been co-created by Dr. Francesca Fusco, Scalp Care Specialist who is a world leading expert in dermatology and scalp care. Enriched with Soya Vitamin Complex, it gently cleanses weakened, easily broken hair while reinforcing the tresses from root to tip. The shampoo comes in a golden colored bottle with a slim shape. It has an easy to open flip cap and the shampoo comes out quite easily. The conditioner comes in a tube of the same color as the shampoo and has a flip cap at the bottom. The smell of the shampoo and conditioner isn’t very strong, and it is hard to actually identify a fragrance. The shampoo doesn’t lather much, but rinses out well. When we tried, after washing the hair felt softer and nourished. It became a lot easier to detangle, especially at the ends of the hair which has the greatest tendency to become a tangled mess. As a result, there was less breakage and showed less hair on the comb than usual, though we’re not sure about the strengthening of the hair from ‘root to tip’. If you’re applying oil beforehand, it would take two washes with the shampoo to wash out all the oil, one wouldn’t be enough. Shampoo – 400 ml: 375 rupees. Conditioner – 180 ml: 190 rupees. You can buy this shampoo and conditioner from any general store near you as Sunsilk is a very renowned company. The main claim of the shampoo and conditioner was reduced hair fall. We’d say that it is more of reduced hair breakage. After washing, your hair becomes smoother and easier to comb, which reduces the breakage. We’re not sure if continued usage of the shampoo would cause any effect to actually reduce hair falling from the scalp. Our main concerns are that it doesn’t wash out oil completely and does not combat frizz effectively. However, it would be okay as a mild daily shampoo and conditioner, provided you don’t apply oil beforehand. 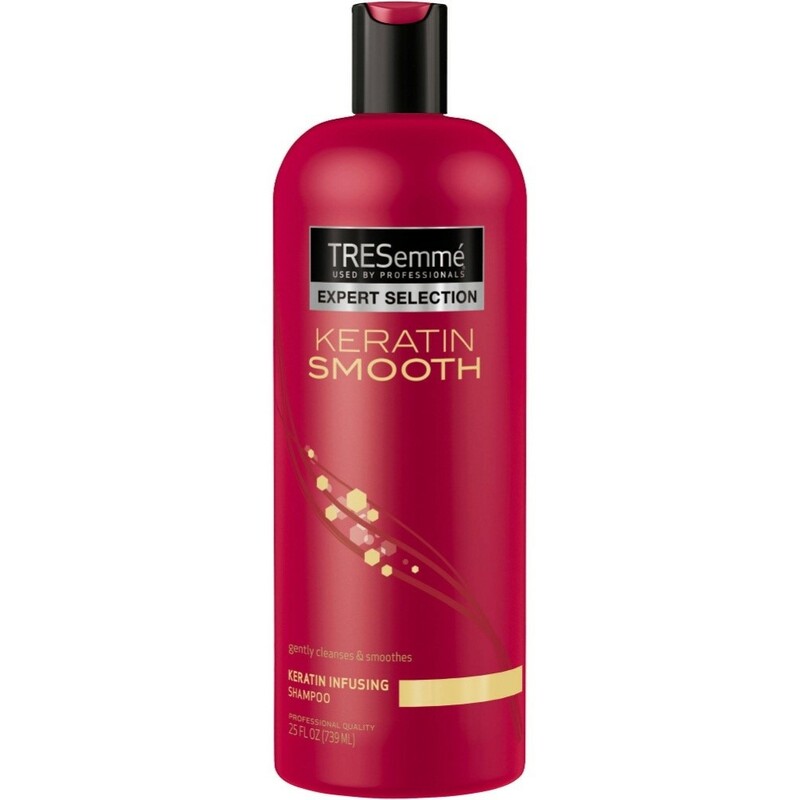 Today we are going to review Tresemme Keratin Smooth Shampoo as we have been personally using this great shampoo for over two months. This shampoo is great when you have recently gone through a hair straightening treatment like rebonding or extenso, or even if you have dry and rough hair. Product Claims: Want hair that’s smoother, straighter and easier to style? Use the shampoo specifically formulated to leave your hair gorgeously sleek and manageable. The Tresemme Keratin Smooth Shampoo and system transforms your hair, making your hair gorgeously sleek with less frizz, smooth and easy to style. Infused with keratin, the shampoo, with lower sulfates, gently cleanses to leave hair clean, shiny and manageable. Our Experience: Tresemme Keratin Smooth Shampoo is packed in a large red colored shampoo bottle. Since the bottle is very bulky, it is not a very travel friendly packaging. However, this shampoo also comes in other sizes which are easier to travel with. This shampoo is transparent in color. The consistency is perfect as it is neither very runny nor too thick. It applies easily and lathers nicely. It has an awesome smell that makes one feel very fresh. The shampoo works well to clean hair, even heavily oiled hair. It is also very easy to wash off. Tresemme Keratin Smooth Shampoo really does what it claims. The hair is definitely very smooth and the frizz is controlled to an extent. I have tried it using without a conditioner and the hair still feels soft and manageable. It will not straighten your hair as such, but the smoothening effect will make the hair look sleek and shiny, and if you have gone through a chemical treatment like rebonding it will leave your hair as straight as ever. However, the shampoo has some shortcomings. It contains a lot of chemicals. It does not give any volume to the hair and might flatten out fine and thin hair. We have also experienced a slight build up after using it continuously for 2 weeks. · Makes hair smooth and frizz free. · Cleanses hair very well. · Gives softness and shine to hair. · Good for unmanageable thick or rough hair. · Contains lot of chemicals. · Gives no volume to the hair, hence not good for fine hair. · No evident straightening of hair. Price: PKR 475 – 599 for 500 ml. Where to buy:This great shampoo is easy available at all the local general stores and super marts. Additionally, daraz.pk gives you a discounted price on this shampoo, so you can easily buy from there. Recommendation: Tresemme Keratin Smooth Shampoo is an awesome shampoo to try if you are not completely satisfied with your current one. Very reasonably priced compared with the quantity, this shampoo smoothens and detangles your hair perfectly. Be a bright blonde with Paul Mitchell’s Platinum Blonde Shampoo. Containing the finest ingredients to help boost and brighten whites, greys and blondes, it will also banish brassiness and restore the luminosity to highlighted hair. Paul Mitchell’s advanced formula found in Platinum Blonde Shampoo contains cool violet pigments to brighten and enhance blonde, grey or white hair while neutralizing yellow tones, diminishing that brassy blonde effect. Also containing a powerful combination of conditioning agents and extracts that provide ample moisture and intensified shine while mild ingredients cleanse and retain moisture to soften your hair. It’s a purple-tinted shampoo, especially formulated to keep cool blonde or white hair looking beautiful and bright! The purple colour of the shampoo counteracts the yellow (or warmth or brassiness) that you usually see in blonde hair, especially right after it is lightened or as the toner starts to fade out. Those of you who are familiar with the colour wheel from art class will remember that lavender is directly across the wheel from yellow, and therefore cancels it out. It smells like it is something that we should be eating, and it leaves the hair feeling soft and moisturized. It was reformulated a year or so ago, and we love the new formula so much more than the old one! You would leave the shampoo in your hair for 5-10 minutes (this time can vary for different people) before rinsing it off. Rinsing with cool water is best, as it closes down your hair cuticle to help trap the color in, and makes your hair feel better as well. You also don’t have to use this every time you wash your hair. 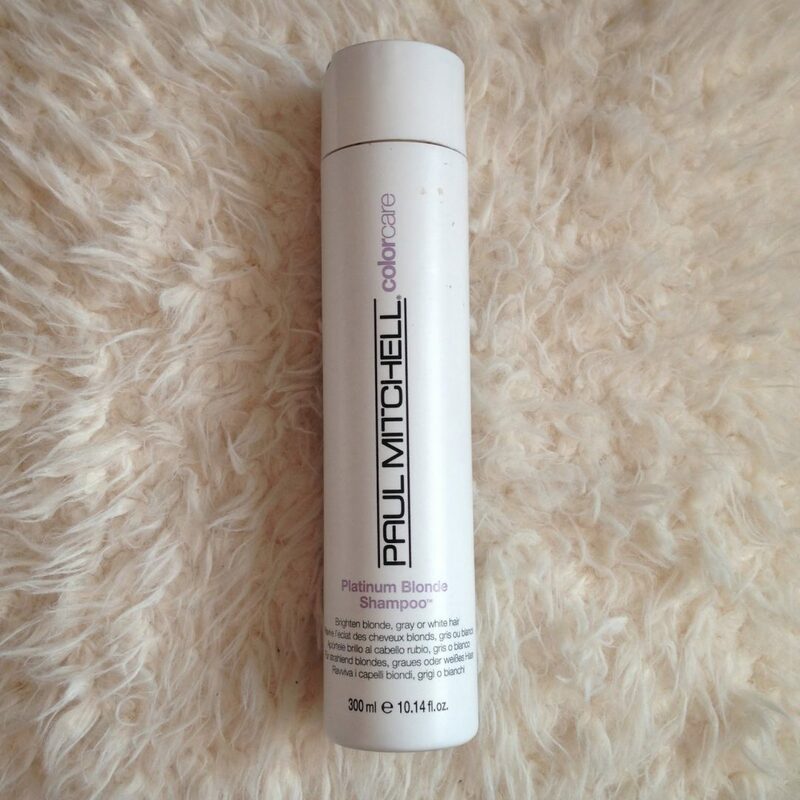 You can purchase Paul Mitchell Platinum Blonde Shampoo from online from Amazon. A 10.14oz bottle retails for $12.95. Also available at top local super markets. 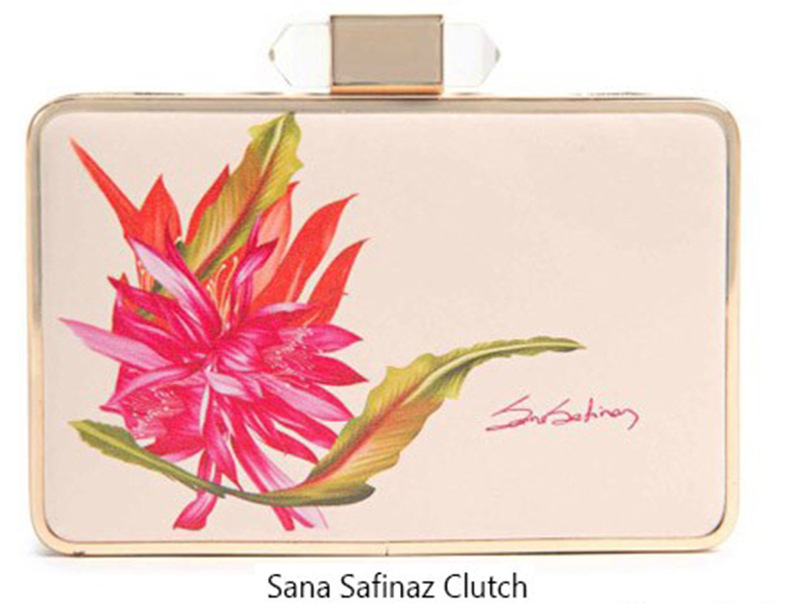 Your morning brunch will be incomplete without these key ingredients- a delicate pink Sana Safinaz clutch and rose gold accessories are all you need! Casual winter days have arrived and there’s no better way to dress up your everyday look than with a laid-back cross body Sana Safinaz bag and a pair of Paul Andrew Gladiator heels! Kick those pesky Monday blue’s and add a pop of color to your work outfit with these gorgeous electric blue statement pieces- paired with a crisp white top and Sana Safinaz embellished sneakers; you’ll look street style chic in no time. Laser cut is all the rage this season and the SS candy pink clutch is perfect for glamming up your look; add a pair of studs and sky-high heels like Aquazurra’s fringe heel for some real Barbie doll feels! So, there you have it ladies, leave all your styling woes to us and check out Sana Safinaz seriously drool worthy accessories collection; now available online and in store! During winters sometimes we are in socks all day long and this is where our flip flops fail us. Also while traveling, shoes take space and care while packing. For most trips, we bring a pair of nice looking sandals, which are casual enough to act as a substitute for flip flops, comfortable enough to wear all day and chic enough to not look like bathroom slippers for a night out. 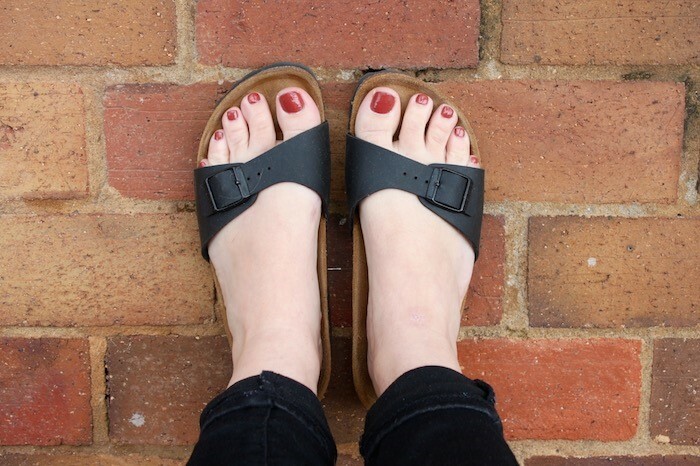 We did our research and landed on Birkenstock Madrid sandals, one of the first styles that the company ever designed. Birkenstocks tend to elicit images of frumpy looking clogs, but the brand has created some new styles and revived old ones. Adjustable strap: The strap that crosses your foot is adjustable, which is great for when your feet swell on a plane or when you want to wear socks with them. We recommend wearing them tighter than you think you’ll need, as they stabilize your foot better. Cork foot bed: This is a signature of Birkenstock shoes, providing arched support and shock absorption. The product description also claims that the sandal improves your circulation. Large toe box: It doesn’t crowd your toes. Multiple colours: Birkenstock makes Madrids in dozens of funky styles and colours, including metallics and prints. Black can be a safe neutral choice. True to size: When you choose your size, know that it will be accurate, not too big or too small. Lightweight and packable: These shoes are no more than 1 pound because of the cork material, making for an ideal travel shoe. They can also fold flat, saving valuable space in your bag. Durable: Birkenstocks last for many years before showing wear and tear. The breaking in process: Be aware that you can’t comfortably wear them straight out of the box. Like other types of shoes, specifically Rainbows- they have to be broken in and molded to fit your foot. This can be uncomfortable for some and prevents them from enjoying Birkenstocks. We recommend that you wear with them with socks around your house for a few days before you bring them on a trip. Price: Priced around $30 USD, they’re not extremely cheap, but it’s better to spend more on shoes that will last rather than continually buying low quality footwear. You can buy these amazing slide sandals online from Amazon, ebay and Nordstrom. The Mario Badescu brand is a behemoth when it comes to all things skin care. The brand specializes in personalized skin care, which means that it sells multiple products for every type of skin (and skin problem) possible. The website even offers a skin analysis in case you’re a skin care newbie and want to get started on the journey that many of us are so very dedicated to. Though the brand in general is a major fave, it also has a few products that are best-sellers, including the facial mist. Now, a brand-new scent has been added to the line. Previously, the brand already had the facial mist available in an aloe, herbs, and rosewater scent, as well as an aloe, cucumber, and green tea scent. Both facial sprays revitalize dull, tired skin and offer a “boost of hydration,” according to Ulta. Now, Instagram account @trendmood1 is reporting that it’s adding an aloe, chamomile, and lavender scent to the line. According to the post, the product is “a facial mist with an infusion of calming botanicals and lavender essential water. Delivers a soothing boost of hydration, leaving the skin balanced and bright. “It will be available exclusively both online and in Ulta Beauty stores on December 26th. It will likely be the same price as the other mists, which is $7 for four ounces. If you just can’t wait to try the new scent, shop the Facial Spray With Aloe, Herb and Rosewater and the Facial Spray with Aloe, Cucumber and Green Tea on Ulta now. 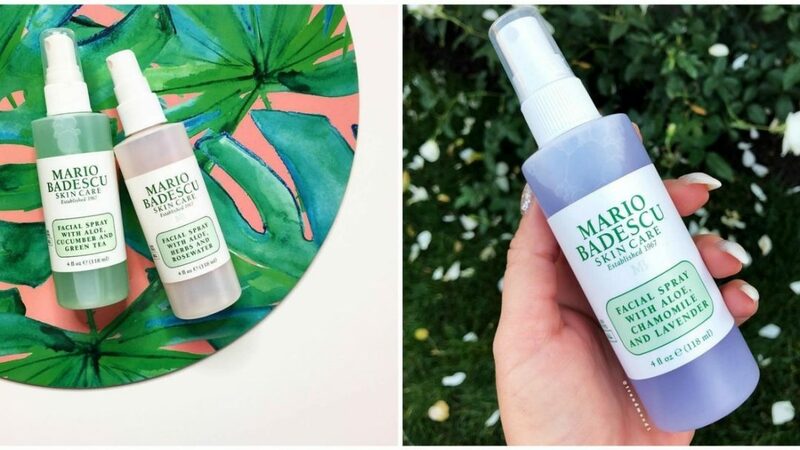 Mario badescu facial sprays are formulated to deliver complexion-enhancing benefits to the skin. Infused with botanical extracts like Gardenia, Rose, and Thyme and formulated with nutrient-rich essential waters like Cucumber and Peppermint Essential Water, our facial mists leave all skin types hydrated, glowing, and refreshed. One of our most frequently asked questions is what the differences between the rose and cucumber FACIAL SPRAY are. The original FACIAL SPRAY with Aloe, Herbs and Rosewater is a classic facial mist that gives skin a dewy, radiant finish. FACIAL SPRAY with Aloe, Cucumber and Green Tea is designed as the perfect pick-me-up that tones and invigorates tired skin. Both mists are meant to multi-task. Use them before moisturizer (on clean skin) to add more hydration, to dampen your favorite makeup brushes or sponges, as a final step after makeup application to give your skin a dewy finish, or throughout the day as needed. You can shop all the Mario Badescu products from its own website as well which is worth $7per bottle. Looking for anti-aging skin care products that can help improve the overall look of mature skin? 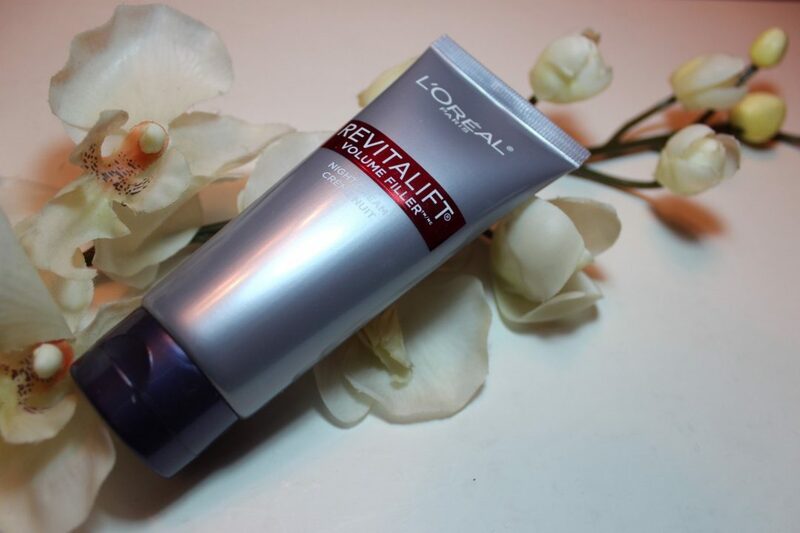 Look no further than L’Oréal Paris’ RevitaLift Volume Filler night cream. When it comes to anti-aging skin care products, we want to ensure that we are not only focusing on our visible skin imperfections (they can be fine lines, wrinkles, dark circles, and more), but we are refilling our skin with hydration, too. L’Oréal Paris RevitaLift Volume Filler night cream is formulated with the powerful humectant, hyaluronic acid, to help replenish and restore our skin’s natural moisture and improve the overall look of aging skin. Find out why you need this amazing product for the anti-aging purpose, below. Recommended For: Dry-looking, mature skin types looking to reduce the appearance of visible wrinkles and improve the overall look of their skin. As our skin ages, it can begin to experience noticeable volume loss and a decline of the naturally-occurring substance hyaluronic acid – a humectant that can hold up to 1000 times its weight in water and can help provide hydration to the surface skin when applied topically – so, choosing anti-aging skin care products that are formulated with hyaluronic acid among other hydrating ingredients can be helpful in achieving the appearance of fresher, softer, more supple skin. This night cream helps visibly replumb skin while sleeping and helps smooth the appearance of sleep lines and pillow traces. Why We Love It: Upon application, the normal to dry skin feels instantly soothed, hydrated, and supple. We noticed that the complexion looked better, you all should make it your new must-have in your routine! How to Use It: After cleansing your surface skin of makeup and impurities and following up with your night time skin care regimen, apply L’Oréal Paris RevitaLift Volume Filler Night Cream all over the skin of your neck and chest in upward circular motions. Price: $14 at Amazon, $16 at Walmart and $24 at L’Oréal Paris’s own website. As the temperature continues to drop, you have probably noticed the negative effects on your skin as it becomes dry, flaky and itchy. Walking down the aisles of the store, it’s quickly apparent that the choices of lotions and potions to stop dry skin are endless, but which product should you choose? There’s one superfood solution that is inexpensive, works wonders, and will perhaps make you think you’re on a tropical island. 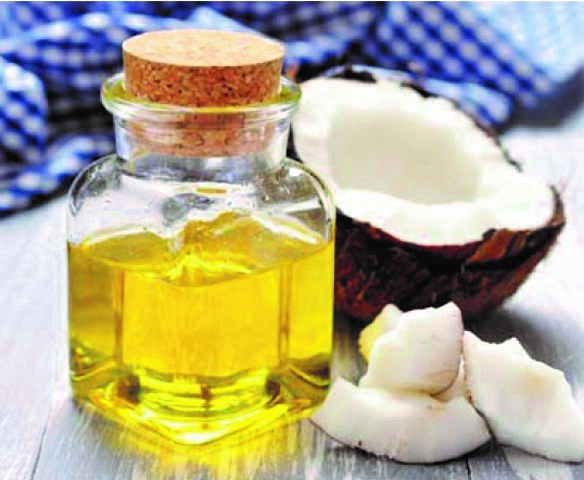 Coconut oil is the perfect product to help ward off the attacks of harsh winters. It is a known fact that winter can cause a mess of the skin. Adding coconut oil to your skincare routine is a particularly good way of protecting yourself against the damages of bitterly cold winds and dry indoor conditions. Coconut oil is rich in medium-chain fatty acids, which allows it to retain the moisture content of the skin while helping it to look and feel silky smooth. It also has high quantities of vitamin E; an essential nutrient for healthy skin growth, repair, and the prevention of premature aging. Coconut oil is also rich in many proteins that contribute to cellular health and tissue repair. Moisturizer: simply rub a small amount of coconut oil wherever you have dry or cracked skin. Your skin will absorb the oil quickly, plus it smells wonderful! Exfoliant: making your own natural exfoliant by mixing coconut oil with natural exfoliating substances like sea salt or sugar is a great way to remove dead cells that accumulate on your skin throughout the winter. Lip balm: applying chemical products on your lips is a sure way to ingest potentially harmful substances. Substitute your chemical lip balm for coconut oil and keep your lips moist and protected throughout the winter.